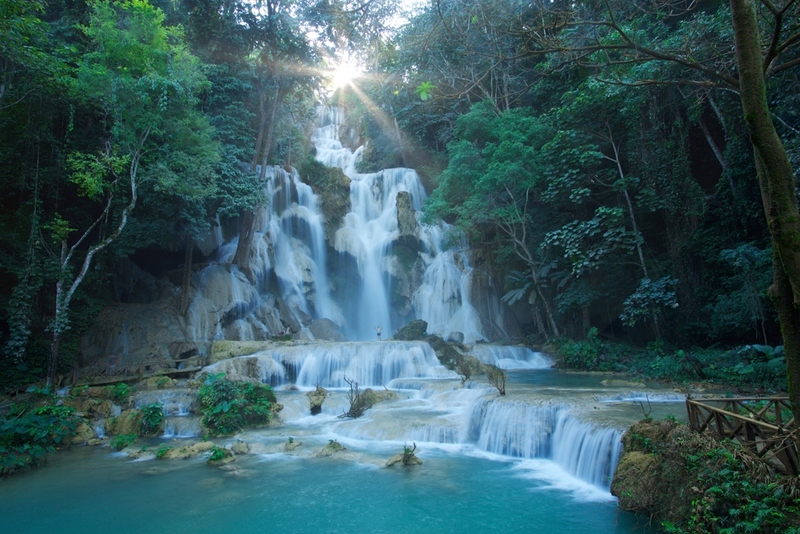 Kuang Si Falls is another “must-see” attraction in Luang Prabang. The falls are truly spectacular and the biggest waterfall in Luang Prabang. This multi-tier waterfall is about 30km out of town. To get there, you'll have to travel by songthaeaw, tuk tuk, motorbike, or by boat and tuk-tuk. The fee varies ranging from around $5- $10 per person and the journey takes about 50 min – 1 hour by tuk-tuk or songthaeaw. Everywhere in cafes and travel agents in town there are signs advertising group trips to Kuang Si falls. If you prefer to follow your own schedule rather than having to fit in with others, you can hire your own tuk-tuk for around $15 for half-day rental. Most travel agents can help you with this though it could be more expensive than dealing direct with the tuk-tuk drivers. 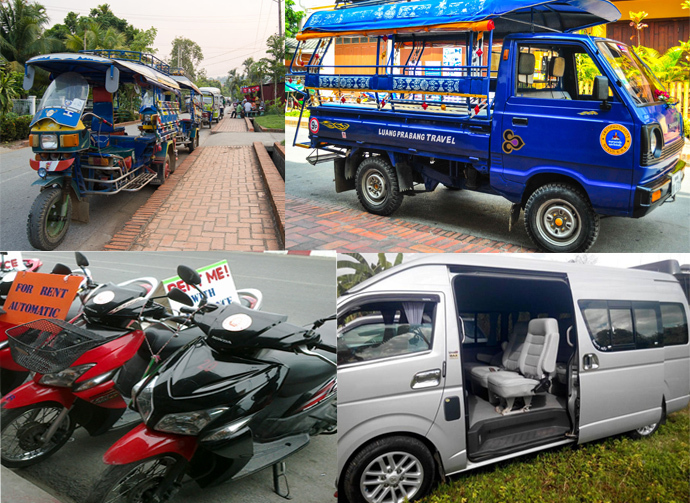 If you want to hire a tuk-tuk, you can ask your guesthouse or hotel for a recommendation or walk out on street and tuk-tuk drivers will approach you to offer their service. You need to ask the price, do your bargain (get everything cleared) before jumping on the tuk-tuk to avoid possible misunderstanding or frustration that might happen. Mini buses: There are two scheduled (mini) buses daily, running between Kuang Si Falls and Naluang Mini Bus station (opposite side of the road to LPB southern bus station). You can board the bus at the station or in town (no pick up fee). If you buy your ticket at one of the many travel agents in town it is usually more expensive, though they arrange a pick up at your hotel or somewhere that is convenient for you. If you go to the Kuang Si Falls and come back to town the same bus, you have around two hours to spend at the falls, that's enough time if you don't climb up to the top to see the source of the waterfall. If you prefer to stay longer, you can take the earlier bus to the waterfall and take the later one back to the city or find another transport back to town by yourself. You can charter a mini bus to the Kuang Si Falls for 350,000kip (max 6 people), or 450,000kip (max 11 people). This way you can stay as long as you want or up to full day at the falls. If you are a couple and confident in your motorbike riding skill, you can rent one in town for around US$15 per day, that's pretty good for two people. This might not be the most comfortable mean of transports, but you get the bike for the whole day which you can ride to visit other places as well, the freedom, and best of all you will have fun. 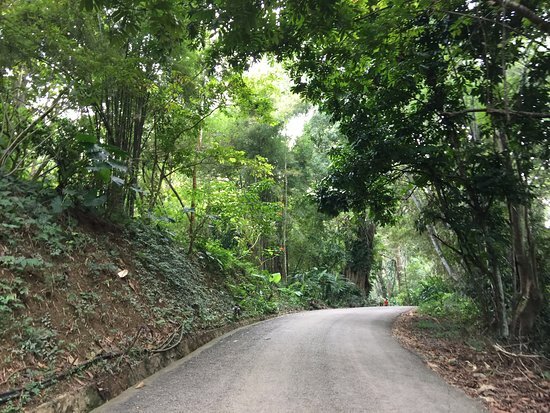 The road to the falls winds through hills with spectacular natural views, including terraced rice fields, which make the trip a refreshing and mind-cooling one. On the way to the Kuang Si Falls, there is a Hmong village where the old ladies still wear Hmong traditional costume. It is famous for its hand-woven handicrafts. If you hire your own tuk-tuk or mini van you can ask the driver to stop there on your way. It's worth to stop by to see the village, its handicrafts or the way of life of the villagers. If you fancy taking photos of girls in Hmong costume, beware that you might be asked to buy their stuff in return and some can be a little too pushy. When you get closer to the Kuang Si Falls you will feel that the weather is cooler and fresher, that's because the area is high and covered with forest. 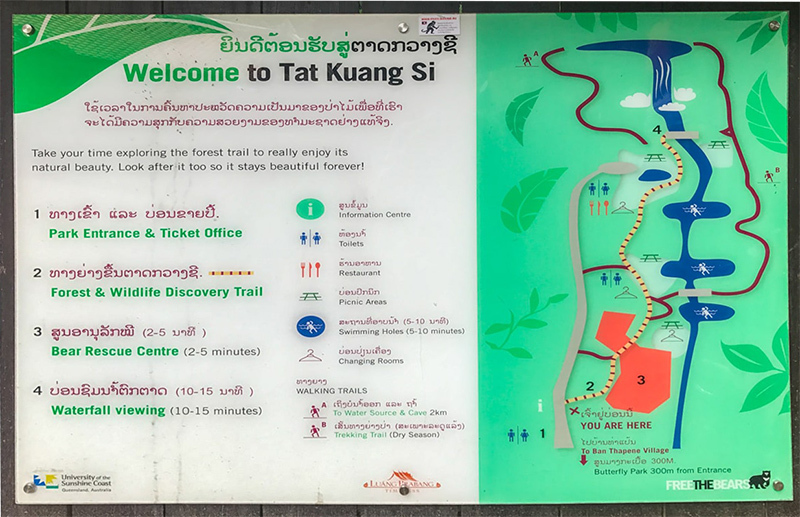 There is an entry fee of 20,000 Kip per person (around US$2.5) to enter the Kuang Si Falls area, not expensive at all, compare to what it has on offer (the spectacular view, the cool place to escape the heat, the crystal clear natural pools to swim in, and the up-hill trail to challenge your physical fitness). I'm sure you will agree that it's worth the money. At the entrance there is a trail map to help you plan your paths before starting, but if you can't be bothered with the map, you'll be fine wandering around as the site is well maintained with walkways clearly marked and bridges to guide the visitors. After paying the entry fee, follow the path through a forested area where there are enclosures housing Asian black bears rescued from poachers. Public toilets and changing rooms can be found on several spots along the path, look for small wooden huts. Picnic benches are also available around the park. The whole park area is shaded and cool that makes it perfect for a relaxing family outing and picnic. Sitting under the shade watching children swimming or jumping up and down in the pools can be relaxing and enjoyable. You may find that you can't help jumping in the pool yourself. There are many falls and some of them are multi-tiered with several blue pools of water and small cascades at the bottom. At the biggest fall, the water drops a whopping 50 meters into another turquoise pool. Most of the pools are open for swimming (one is closed as being a sacred site), they're clearly marked. Be prepared though, the water is very cold. There’s a bridge over the water, a popular spot for selfies. Standing there you will feel the drizzle from the roaring waterfall. It's a great cool-off spot, in facts, the whole park is a great cool-off area that is popular among locals and tourists alike during the hot season. 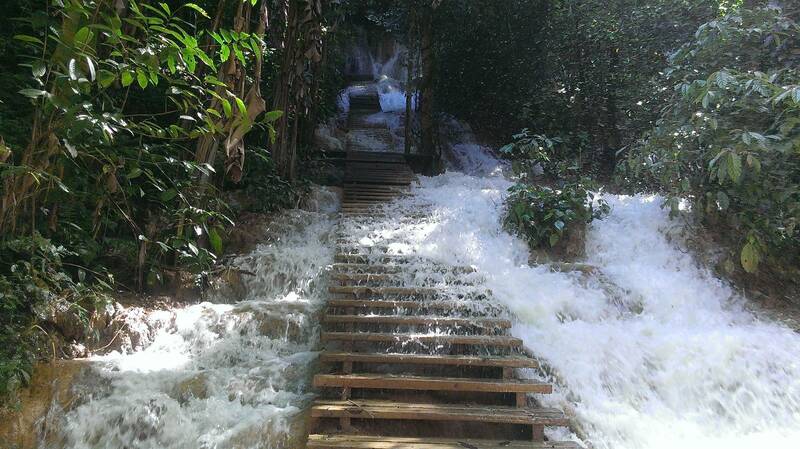 There are also trails to climb to the top of the falls where there are more natural pools for swimming. On either side of the bridge there is a path leading up to the top of the waterfalls. The easier path is the one on left side, with steps facilitating your climb. The path on the right side is the harder, with no steps or handrails, requiring you to climb a bit at some points. The trail at Kuang Si Waterfall. 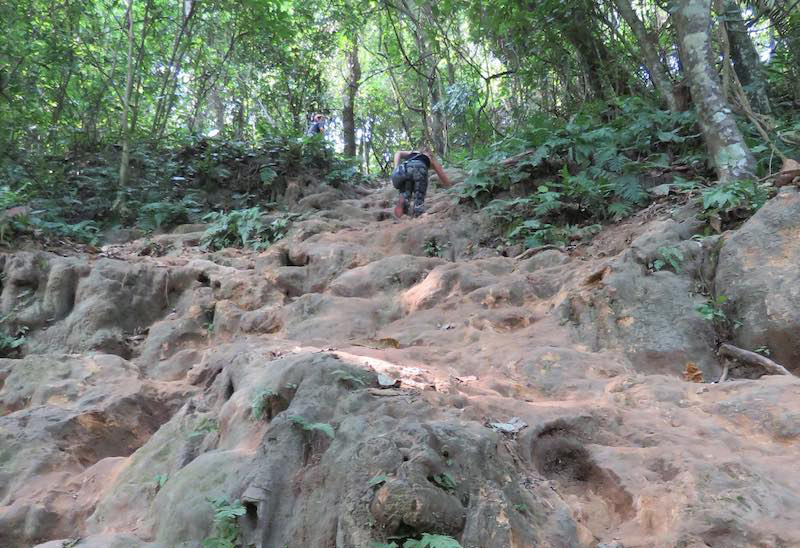 The trails are steep and can be slippery when wet, you’ll need proper shoes (sandals, not flip-flops) to climb to the top, but the climb is well worth the effort. Don’t forget to take a bottle of water with you, I’m sure you’ll need it during your climb. Most people climb up the path on the right side and coming down the left side (recommended). Up there you will find a huge and very impressive pool and its source. You can cross the top of the falls and this is a great place to get a good view down. As mentioned, the trails are steep so... may not be suitable for unfit adult, or small children. Not sure if there is a recuse team on site if you need help getting back down. After all that climbing or swimming, sure you will get exhausting and hungry/thirsty. There are many stalls selling food and drinks near the picnic area at the entrance. You can buy food/drinks from the stalls, then choose your best spot (there are benches scatter around the area) to enjoy your food/drinks. Or if you would like something more decent, there is a restaurant call Kuang Si Green Restaurant, with a nice view of one of the small waterfalls. The food is freshly cooked to your order, more expensive though. You can even take your own food, and drinks from town and get a spot for picnic there. The park is actually a popular family picnic area among locals. so... why not? 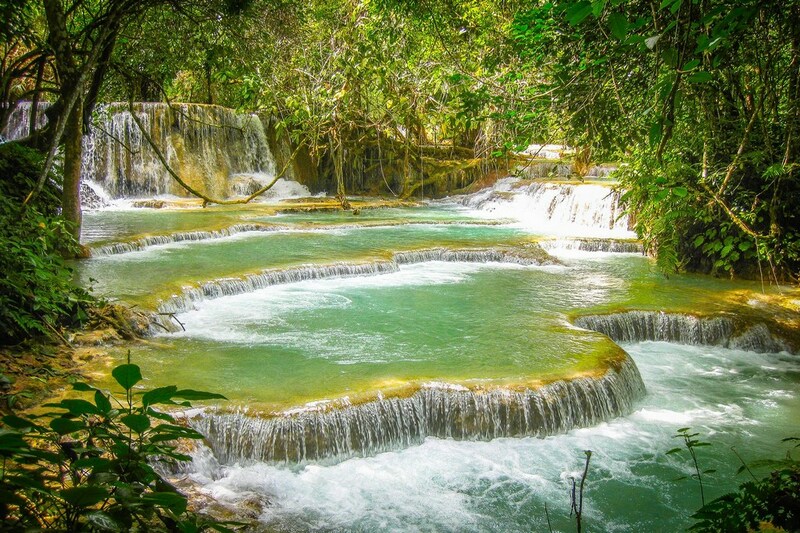 Not only are the waterfalls and pools gorgeous, the area is also a great place to escape the heat from Luang Prabang. 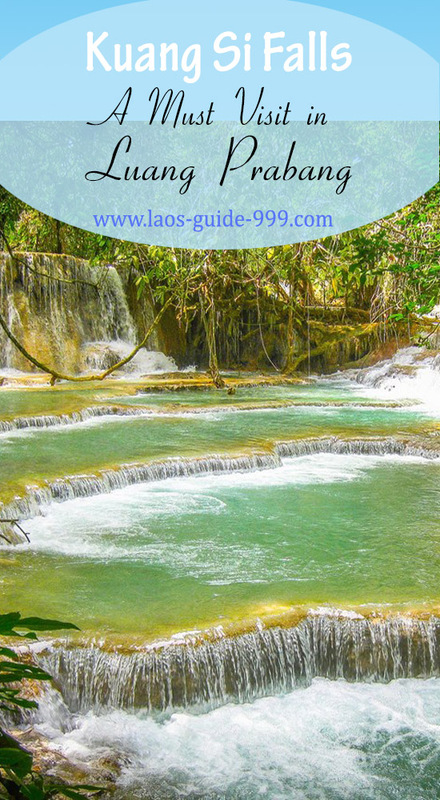 A half (or a day) trip to this waterfall is a must do when visiting Laung Prabang. If you just have one day in Luang Prabang, I would recommend a half day trip to Kuang Si Falls and spare another half for the rest. You will thank yourself for making an effort getting there. Did you like or find this page helpful? If so, please help me spread the words by sharing it or pinning this image below.